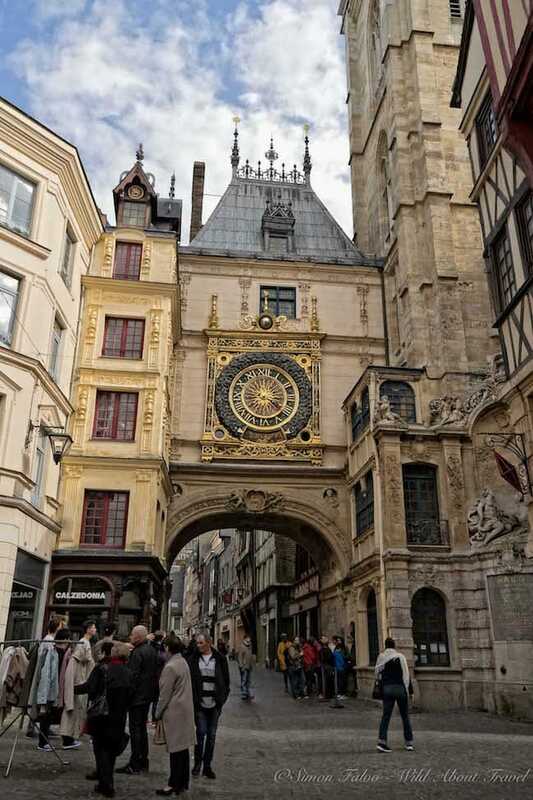 My passion for art and the Impressionists led me to visit Rouen. There, I discovered the beautiful medieval quarter of Rouen old town. I visited France several times over the past years but never went as far as Normandy. I’d been dreaming of discovering some of the main sights of what I always imagined like a beautiful region: the Mont-Saint-Michel at low and high tide, a long reflection on the ravages of war at the WW1 battlefields, moments of bliss at one of the pretty towns along the coast, a walk on the cliffs of l’Etretat. I was heading to Paris to take care of three lovely cats and managed to add a few days before reaching the French capital. Soon, I found out that I needed much more time than three stretched days and that I would have to hire a car to get around quicker and easier. However, I didn’t want to rush. In my imagination, Normandy was a region calling for slow travel, taking the time to savor the small things. I studied the map, looking for a destination not too far from Paris and attractive enough. My passion for nature and outdoors is second only to my love for art and architecture. That’s how I got to decide where to spend these few days. 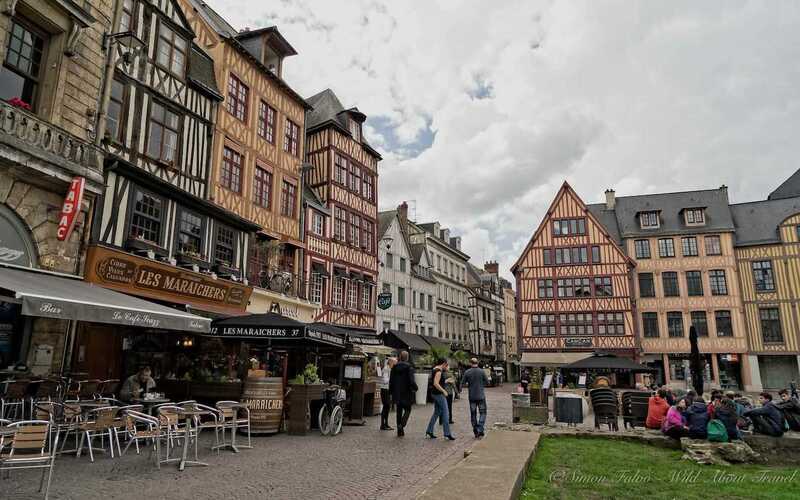 I would head to Rouen, the capital of Normandy. After all, Normandy is where Impressionism was born, and with that in mind, I remembered Monet’s beautiful paintings of the Rouen Cathedral, captured at different times of the day and of the year. And so Rouen it was. As I always say about Milan, the Italian city where I live, you haven’t seen it if you don’t visit the Duomo. The same applies to the Rouen Cathedral, the symbol of the city, though I soon found out that there are many other beautiful sights. The heavy bombings during WW2 destroyed more than 45% of the city. Notwithstanding, Rouen old town is beautiful and it took my breath away. 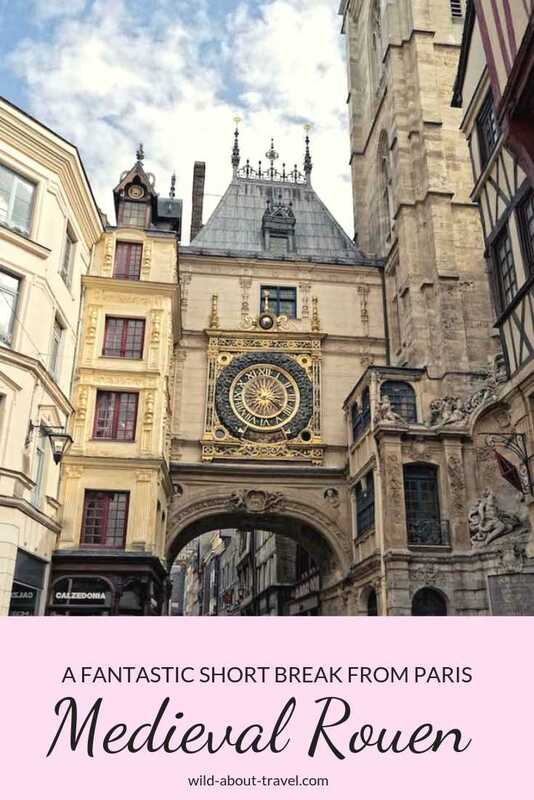 Magnificent gothic churches, charming alleys and lovely squares lined with the typical half-timbered houses, the beautiful arch with the Gros-Horloge, the keep where Joan of Arc was tried, threatened of torture, and sentenced to die, and the typical charm of French smaller cities. 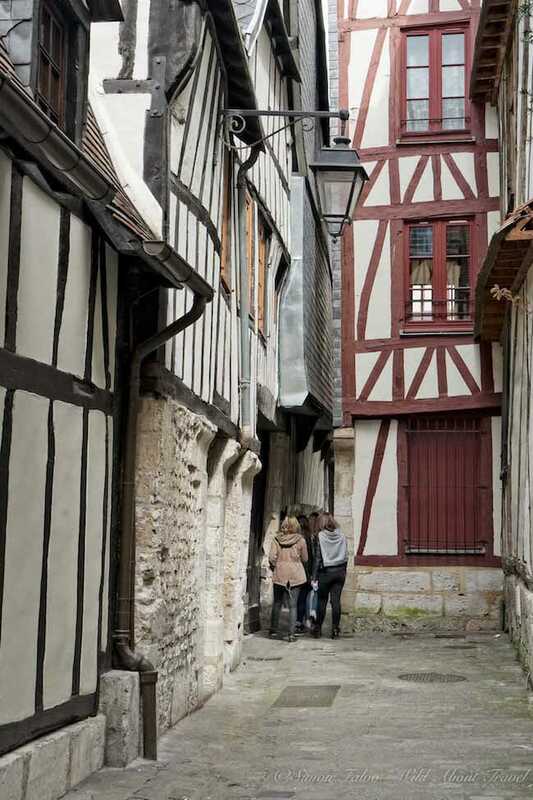 The old town of Rouen is an endless discovery. Although Flamboyant gothic is not my favorite architectural style, there’s no denying that Notre-Dame Cathedral is impressive. The Cathedral of Rouen fascinated Monet, the father of Impressionism, who, between 1892 and 1983, represented it in more than 30 paintings. The three imposing towers are one of the highlights of its gorgeous architecture. One of them, called la Tour de Beurre (The Butter Tower), owes its name to the indulgences that were practiced in the Middle-Age. During Lent, the drastic religious rules forbid the consumption of butter, but people could escape the rule in exchange for a donation to the church and the offerings financed the construction of the tower which was thus named Butter Tower. Much as I like the Cathedral, the gothic building in Rouen old town that stole my heart was the abbey of Saint-Ouen. Unfortunately, the facade overlooks a rather busy square which doesn’t fully valorize it. I moved away from the road and headed towards the peaceful gardens surrounding the external aisles and the apse, which I thoroughly enjoyed. Farther from the traffic noise, the abbey is a place of prayer, silence, and meditation. 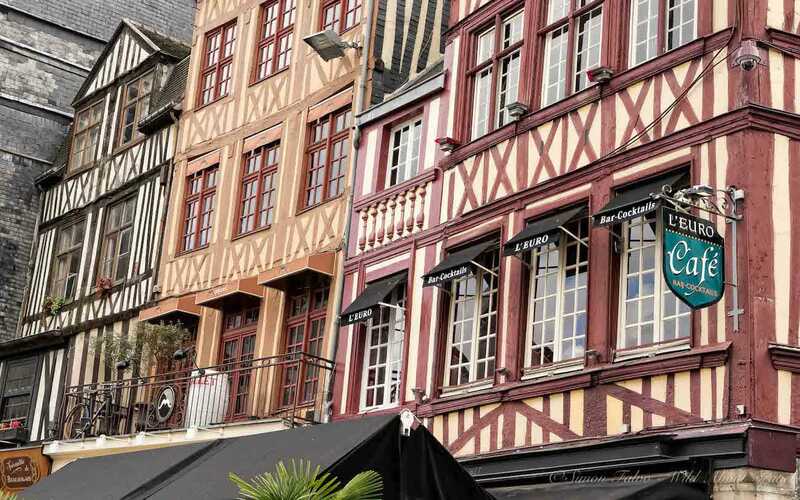 It was, however, the half-timbered houses what made Rouen old town truly special to me, as it had happened in Albi when I visited the city a few years ago. Italy is certainly not short of beautiful architectural medieval examples, but the half-timbered buildings that became typical in Northern Europe during the Middle-Ages hold a Nordic charm which I find fascinating. Among all these well-kept beautiful houses, the newly built church of Saint Joan of Arc in the center of the Place du Vieux Marché looked to me like a heresy. I don’t know how residents feel about it. Even though the church celebrates the Saint who was burned alive right there in 1431, I couldn’t help wondering why such an ugly building should spoil the view of an otherwise beautiful square. I was surprised by how little tourists friendly is Rouen. 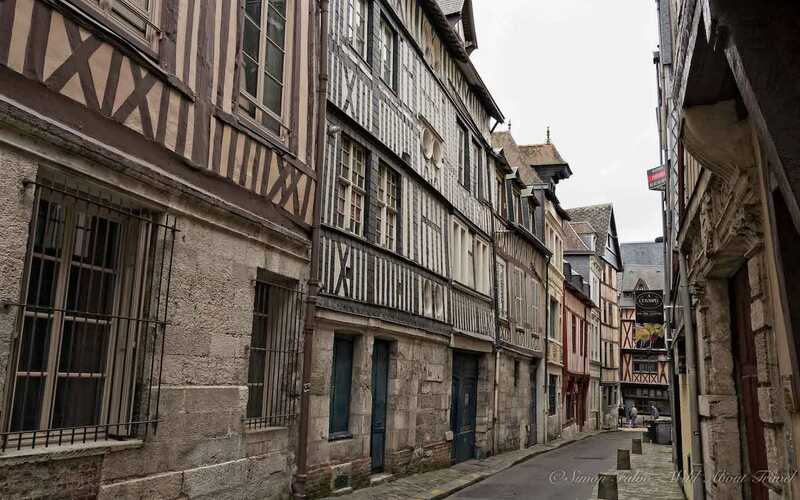 The medieval center of Rouen is small, but as I strolled in the pretty alleys of the old town I noticed that there are no signs pointing to the main attractions. I didn’t really care, since I like getting lost and wander randomly, halting whenever something catches my attention (which happens a lot), going back to the same place at a different time of the day to see it under a different light. However, if you don’t have much time you can easily get confused. Visitors visiting Rouen can only partially rely on the Tourism Office to get a map and a little advice. The office closes at lunchtime as well as on Sundays, so you get the picture. 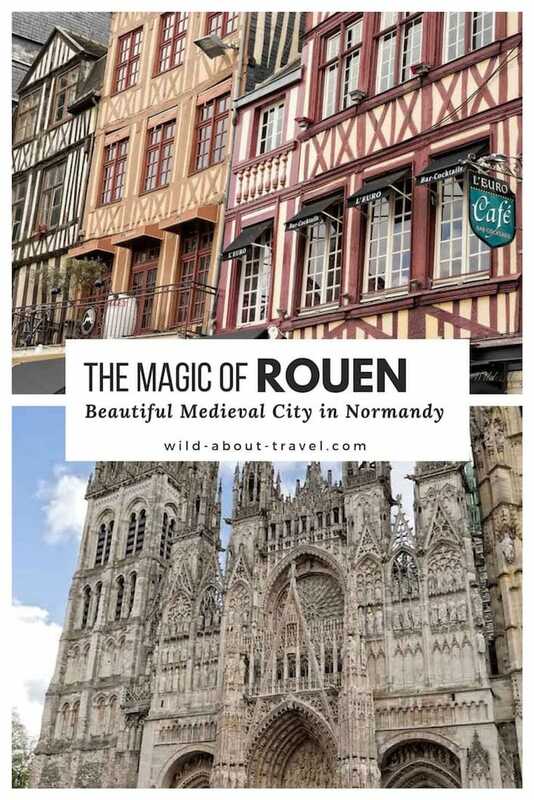 That’s weird, especially as you can also visit Rouen as a day trip from Paris. It’s at the railway station, though, that I made the oddest discovery. Don’t even think of leaving your luggage, since there’s no deposit, nor are there lockers. Keep that in mind if you’re planning to make a stopover for a short visit along the way. Perhaps you can negotiate with the café at the station, or some others nearby. If you’re lucky, they might agree to keep your stuff for a few euro. Start exercising to ask it in French (you might be more successful, if only for the effort). Pouvez-vous garder nos valises pour quelques heures, contre un paiement? If you’re used to eating at any time of the day, beware that most restaurants end their service around 2:00-2:30 pm. Also, many close on Sundays. Therefore, to avoid McDonalds or touristy places, it’s better to have a look before at the opening days and times of your chosen restaurant. The nearest airport is Paris, where you can travel from all over Europe and from overseas. I usually search on CheapOair and Expedia to find good deals on flights. The train from Paris to Rouen takes 90 minutes and leaves from Paris St. Lazare station. 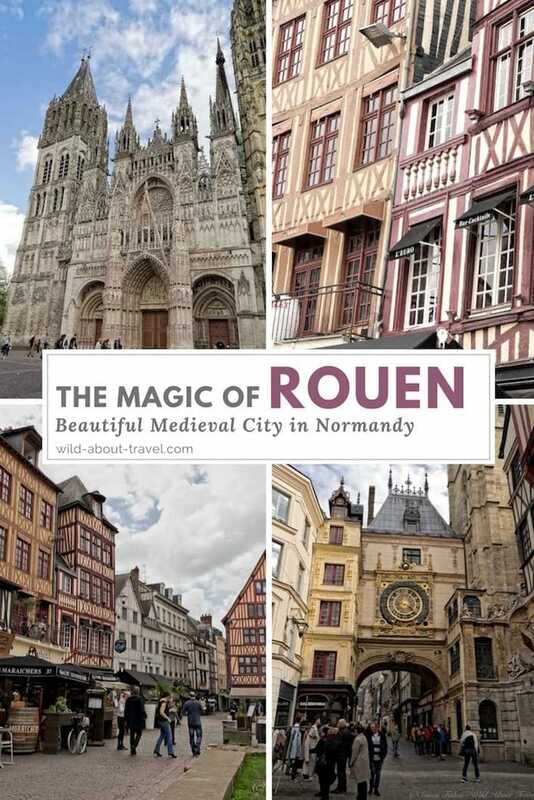 You can also visit Rouen old city as a day trip from Paris, although I recommend spending a night. If you’re in for a treat, you may consider staying at the Hotel de Bourgtheroulde, Autograph Collection. The building, an ancient mansion dating back to the 15th Century, is beautiful. The hotel features also a Spa where you can pamper after a long stroll in Rouen old town. Even if it’s not your accommodation style, it is worth a visit if only for the stunning architecture. Centrally located near the Cathedral, Mercure Rouen Centre Cathédrale offers all amenities and is perfectly situated to explore the old city. More and more often I prefer staying in an apartment rather than at a hotel. For solo travelers, apartments are often cheaper and I like being able to cook my own meals. For families, a flat is a good option so that the kids can have more space and greater freedom. This 50 sqm apartment in the heart of Rouen is cozy and modern. More Hotels in Rouen you can check. If you’re visiting Paris and are short on time, a good solution is to take a day tour. 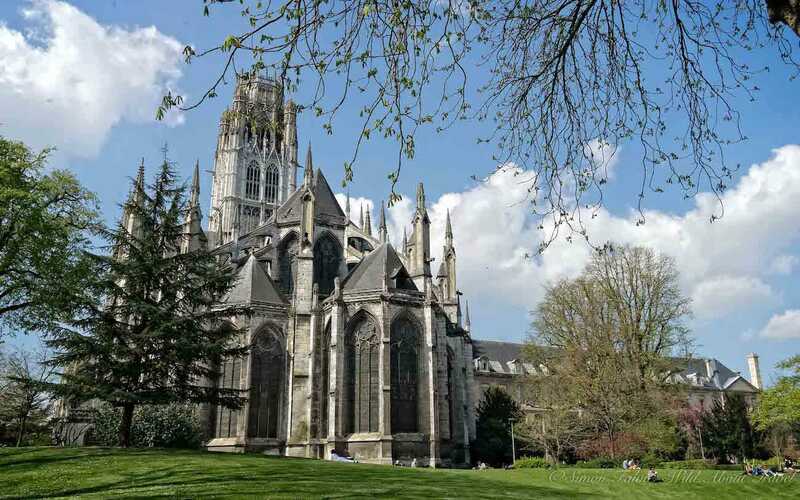 This small group guided day-trip to Rouen will allow you to discover the best sights of the Normandy’s capital and enjoy the views of the countryside and the Loire Valley along the way. If you’re passionate about art, you may want to check the day tour from Paris to Rouen and Giverny, where you’ll discover the gardens of Claude Monet’s home. We all want to have an unforgettable trip, but sometimes things can go wrong. Travel insurance will give you peace of mind in case of unexpected unfavorable events. 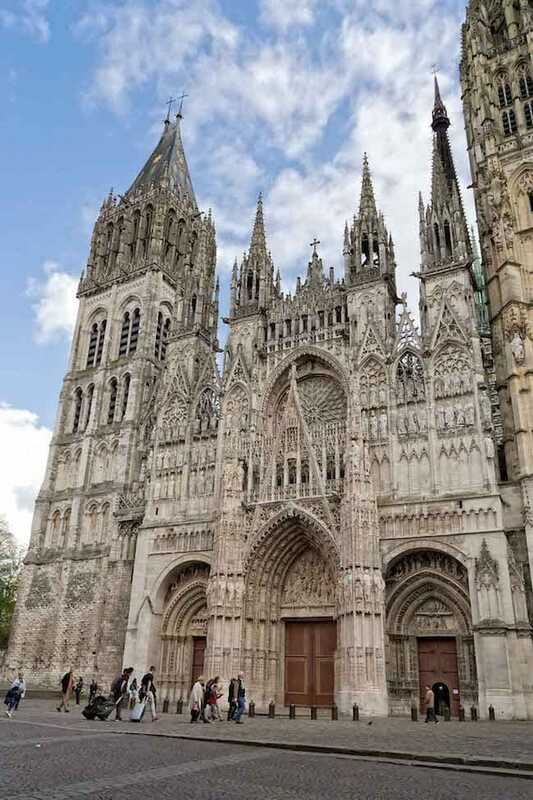 Is it possible to do an early Paris-Rouen train..then get a private guide to take us around the WWII sites and then stay in Rouen overnight and leave the next day to Avignon? However, to visit the WWII sites you have then to travel to Caen (about 90-100 min by train), and you can take a private tour of the WWII sites from there. 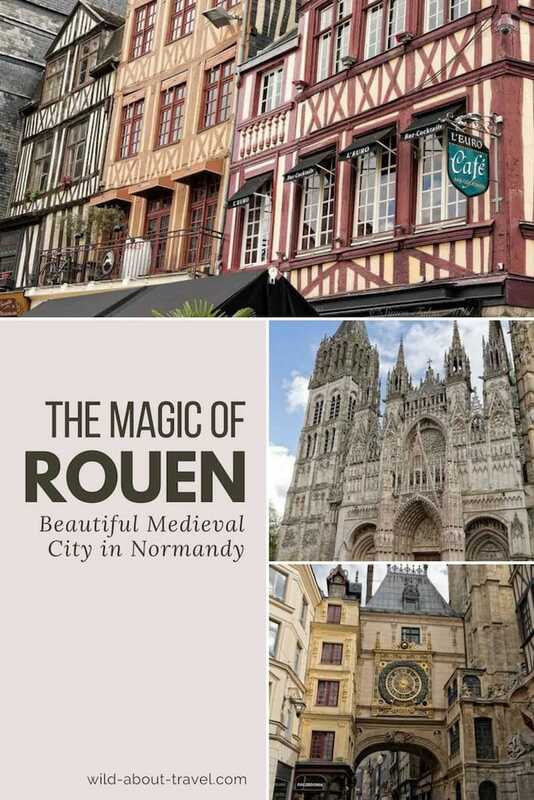 To visit Rouen and the WWII sites you’ll need two days though. 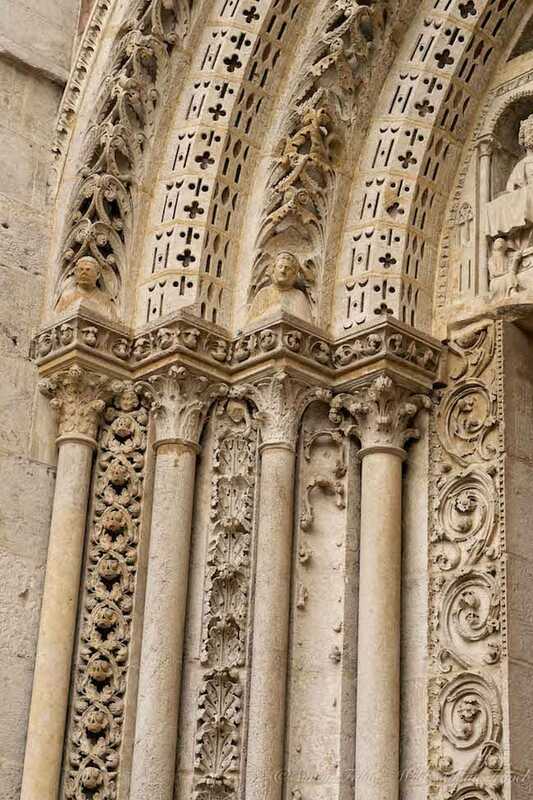 And if afterwards, you want to go to Avignon, it will take almost one day, unless you catch a flight. Interesting place with the history of Joan of Arc and Monet!